I didn’t bother blogging about the second season of Glee, because I didn’t really feel I had anything new to say about the show, despite several gush-worthy guest-stars. To summarize: There are scenes that make me laugh (hard), there are scenes that make me cry, there are scenes that make me swoon, there are scenes that make me yawn, and scenes that make me cringe, all randomly jumbled up together so I never really know how I’m going to feel from one moment to the next… like a game of emotional roulette. It’s addictive, but also extremely frustrating, and generally leaves me wishing I could slip into an alternate universe where there was a firmer hand on the tiller, keeping the show on an even keel. 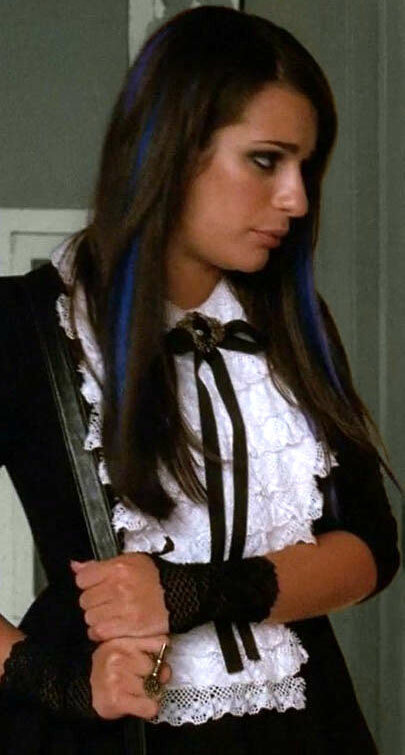 The only constant is my abiding and unquenchable crush on Lea Michele, which spurred me on through the third season (circa 2012), and was amply rewarded in ep #3.20 (“Props”), when a disgruntled and neglected ‘Tina’ (Jenna Ushkowitz) tripped head-first into an ornamental fountain, knocked herself unconscious, and dreamed about swapping bodies with the show-choir’s star performer, ‘Rachel’… leading to the brain-mashing reveal of Michele glowering away in Tina’s abandoned goth-y clothing and make-up. It was the perfect overlap of my interests/obsessions, and I loved every second of this weird (and disappointingly brief) reverie… not least because it finally gave Ushkowitz an opportunity to step up and shine, staking her claim as the show’s heiress-apparent. It was also fun to see Michele playing a more timid and gawky sort of character for a change, though I much prefer her in full-on “cannonball” mode, given the choice. Don’t tell her not to fly, dammit! I’m really behind the curve here, and have no idea what actually transpired in the three seasons that followed the core cast’s graduation… though I do know that they followed Rachel to New York, so I won’t be dibbing out in that department, thankfully. Is there any chance that living in the big bad city convinced her to give up her much-loved show-tunes, and rock-out more often? Probably not… but I did get to hear her covering a (slightly censored) Halestorm track in ep#3.14, so that will have to satisfy me for now. P.S. Oh, I also want to give a shout-out to Vanessa Lengies, who joined the supporting cast this season as ‘Sugar Motta’, a totally spoiled (and tone-deaf) brat, who somehow managed to convince her indulgent father to found a rival show-choir for her to rule over… which was a completely ridiculous and implausible plot-contrivance, but it did give the show an excuse to bring back Idina Menzel as choir-coach ‘Shelby Corcoran’ (hotcha! ), and Lengies was very funny (and strangely adorable) as Sugar, despite the offensiveness of the words coming out of her mouth, so yay for all of that! 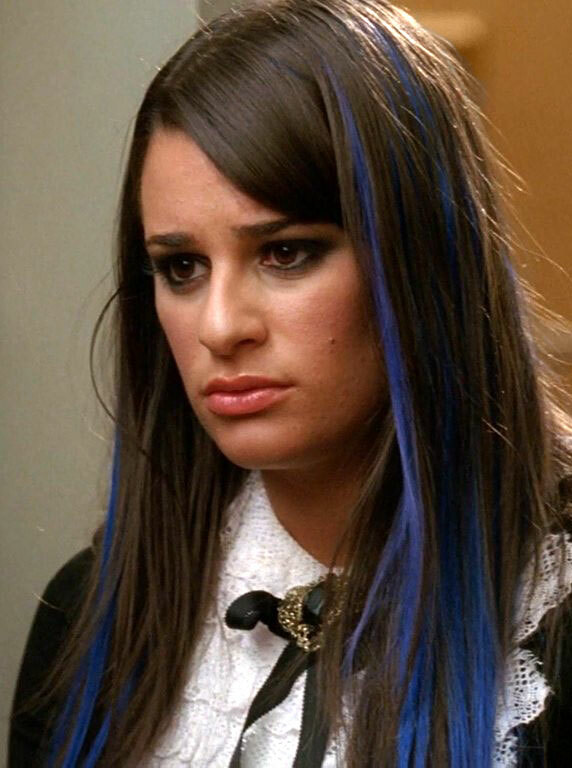 This entry was posted in Rants about Music, Rants about TV and tagged Glee, Gothiness, Halestorm, Idina Menzel, Jenna Ushkowitz, Lea Michele, Rachel Berry, Sugar Motta, Tina Cohen-Chang, Vanessa Lengies. Bookmark the permalink.